Shady the cat - My name is Lily and Shady is my cat. She is 4 months old and lives with me in Toronto, Canada. Our cat loves yogurt and every time we took out a cup of yogurt she would stand at our feet and meow for some too. Eventually we got her own yogurt bowl and we would scoop out a spoon from our yogurt to the bowl. She likes vanilla, peach and strawberry flavor, just like me! She also likes to eat shrimp flavour treats. Our cat loves stretching out on the balcony when its sunny and staring out the window, especially when the curtains are closed. Then she is able to "hide" behind them. We pretend not to see her, but we do, probably because there is a huge bump in the curtain. But when we call her name, she'll peek out with her little face and meows at you. Her funny habits are: Our cat loves biting us for no reason. It jumps up on our arms or legs and bites our finger or toes. She also like playing chase and in the middle of the game, she would just fall over and start rolling, when we least expect it! Once I was playing chase with her and then she stops and falls over; I almost stepped on her! We were searching the free category on the a pet search website and we found an ad that said a very SMALL cat and it was black and white and it had all the cat items we needed to start with it, and we needed those items because we were new to getting cats. 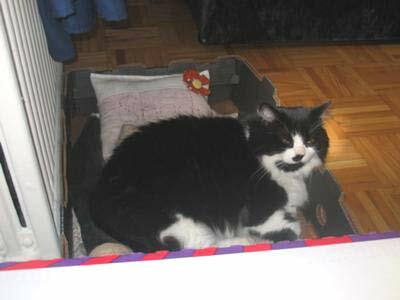 So we went to get the kitty and we learned that she wasn't a kitty, she wasn't very small, she was actually one of the largest breeds of cat and her name was Shady. So we took her home because she was cute. 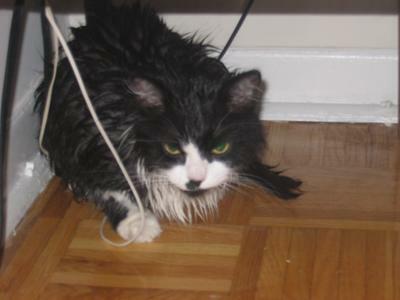 This is a photo of my cat when she first got a bath! Her previous owner had not given her a bath before and we found it very difficult to even get her in the water! I am trying to give more attention to my cat lately because I think she feels jealous now that a NEW CAT has come into the home. They are now fine with each other but my cat is a very lazy cat and takes no interest in playing games with the much younger kitty named Sunny. I took me a while until I realized that Sunny and Shady were antynoms and thats when I also realized that the names had the complete opposite personalities!!!! So here I am, trying to expand my cats page. Cause I want everyone to know how good a cat she is. I also might make a cat hut for Sunny, Shes just sooooooo cute!!! When Shady and Sunny first met, they fought with eachother and hissed and She wouldn't come out from under the bed, which was kind of hard for me because I usually didn't allow cats under the bed during the night. But the they started interacting and sniffing instead of fighting and in the end they're perfectly fine with eachother, except when Sunny decides to ambush shady while she walks past the couch! !